Pigeon racing is a rural sport that involves expertly trained racing and homing pigeons, who are taken to a specially selected place and set free so that they race each other back to their racing loft. It is not necessarily the pigeon that returns back to its racing loft in the shortest time frame that is deemed the winner, as it is the rate of travel that is calculated to decide which pigeon travelled home the fastest. The difference between victory and defeat can be extremely tight, which means that timing methods have to be very precise. One of the latest timing innovations involves using radio-frequency identification (RFID) technology to record the time of arrival home. For this reason, racing pigeons must be tagged. This also helps them to be differentiated from regular pigeons if they get lost en route. The exact history of the sport is not known, but pigeon racing is thought to date back to around 220 AD. It was Belgium that developed the basis for modern pigeon racing in the 19th century. 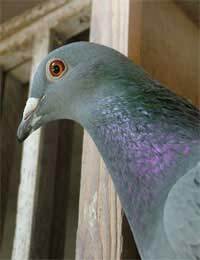 Racing pigeons are bred specifically for pigeon racing, and are trained to take part in the sport from a young age. To compete in a race, they are usually tagged when they are just five days old. Around five weeks of age, they are taken from their lofts and moved to a racing loft elsewhere. The race will take place at a later date, but this is where they will then live until their racing career is over. Pigeons are usually trained for at least six months before a race. Training can take various forms, including making sure that the pigeon is fully familiar with its racing loft and its entry points, and being able to recognise and respond to signals from the trainer. Once the training is over, the pigeons can venture outside for the first time. During a typical pigeon racing season, pigeons will be trained two to three weeks before the start of the season. They will also take part in exercise inside the racing loft for at least one hour per day. Most pigeon racing involves pigeons from various different breeders competing in the same race, but one-loft racing is different. In the interests of fairness, it features pigeons from the same breeder in a bid to discover which pigeon is the best amongst its loftmates. There is usually more prize money on offer in one-loft racing. The Royal Pigeon Racing Association (RPRA) has more information on entering their annual one-loft competitions. There are pigeon racing clubs across the UK. This should be your first point of call if you are looking to get involved in pigeon racing, as it is usually the pigeon racing clubs who put on the competitions. There are two parts to the pigeon racing season: the Old Bird season (which runs from late March to the middle of July) and the Young Bird season (which runs from the middle of July to the end of September).